Yes, that is a real front page, from the May 16 edition of the Gaffney Ledger in South Carolina. Note that the headline isn't a quote, but an editorial decision to use "LASAGNA WAS EVERYWHERE" in huge font above the fold. The full story describes the high-octane lasagna accident in necessary detail. Unfortunately, the Gaffney Ledger has a paywall, but we went above and beyond to find out the details by paying two dollars for a single-issue subscription. 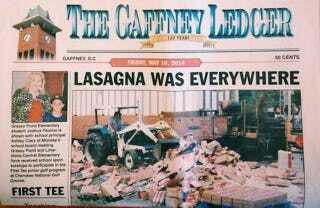 So, how did lasagna get everywhere? Two people, a head driver and co-driver were in the cab at the time, according to Gaffney Police Chief Rick Turner, and the co-driver reportedly was behind the wheel at the time. When the truck got stuck, the head driver took control and tried to drive the truck off the tracks. "While he was trying to do that, he (the head driver) looked up and here comes a train," Turner said. Both of the drivers were able to exit their cab and run across the road. The next grafs describe a scene only Michael Bay could dream up. The train, which was traveling at approximately 32 mph, sliced through the trailer, carrying a portion of it with it as it continued down the tracks. Cartons and boxes of frozen food spilled all over the tracks. When the train came to a stop, its cars ended up blocking most railroad crossings in the downtown area with the exception of the T-Bridge, 3rd St. and Corry Street. No one was harmed, except for the lasagna that ended up everywhere. The ravaged lasagna all over the road also delayed rush-hour commuters. "There was an inch of lasagna ground into the pavement," Turner said. "They (the firefighters) came down with the truck to hose off the road but the water was beading up. They eventually used big buckets of detergent and brooms to scrub the roadway."